Members of the white team cheer on their teammates during a recent scrimmage. Tucked away in a small warehouse on Chicago's West Side is a sanctuary where women can trade in their mom jeans for roller skates and uniforms, adopt a new persona and hit the rink. But it’s not the usual family fun skating rink playing everyone’s favorite Top 40 hits, but a roller rink filled with the past week’s aggression and releases of a heavy work week. It’s a rink where every skater is dolled up in knee and elbow pads, a mouth guard and a helmet. It's a roller derby flat-track -- where Wendy Altschuler becomes "Drew Grit." Roller derby took Chicago by storm in 1935, and it’s been a nationally and internationally evolving sport since. In its early stages, two-person teams would skate around a track trying to cover the most distance in the allotted time. Now it’s more physical. Teams of five play against each other scoring points by lapping members of the opposing team, which is no easy task as skaters hold nothing back to block points from being scored. 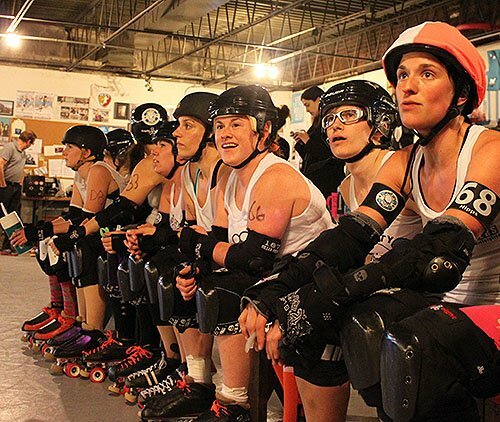 Altschuler and her fellow derby competitors have bouts in the Windy City Rollers, the elite flat-track derby league in Chicago.They were founded in 2004, and today comprise four teams and more than 100 players. Moms, attorneys, journalists and those working in corporate America make up a group of women who support and promote athleticism and fraternity. Altschuler is a mother of three and works as a freelance writer. Like a lot of the women who skate with the Windy City Rollers, she wanted to get involved in something that was completely different from her everyday life. No matter what kind of work they do as a career, or what type of background they come from, one thing all the women have in common is athleticism. Developing into a great roller derby player can take time. It also takes being both a quick thinker and agile. Among the 10 players on the track, only two -- one player from each team -- are able to score points. They’re called jammers. But the only way to score those points is to get through a pack of aggressive blockers, who push and shove to prohibit the jammer from getting through. 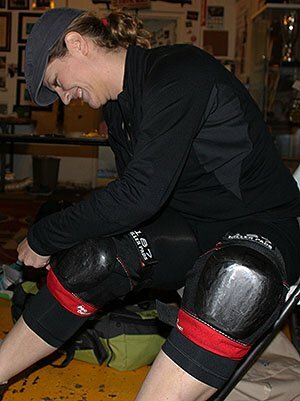 Injuries are common in roller derby, despite the fact that players are equipped with padding and helmets. Candy Amato, also known as "Angel Dust", broke her leg after only playing for two years. Since then she’s been coaching The Manic Attackers, one of the league’s home teams. Amato has been involved with Windy City Rollers since the beginning and is viewed as a mom figure. With all the aggression that comes along with the game, the ladies still manage to have fun. One way in doing so is by the creation of their names. Altschuler’s name is Drew Grit. She grew up in Montana and wanted to pay homage to her western roots and the old cowboy films she grew up on. Amato’s sense of humor landed her with Angel Dust. “Most of the major drugs were taken and that was what’s left,” she said.